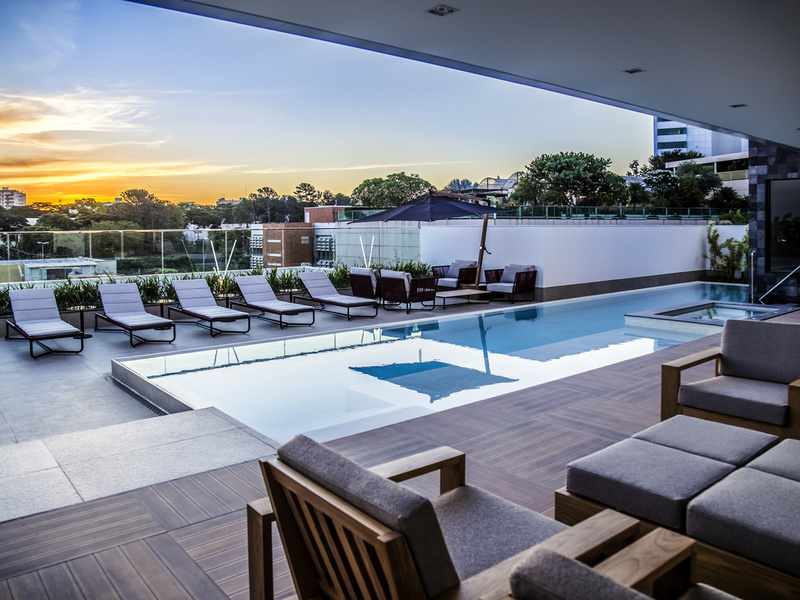 The Mercure Uberlandia Plaza Shopping hotel is the most modern hotel in Uberlândia, and one of the best in inland Brazil. The hotel offers you everything you need to make you feel at home: comfort, personalized service and services of an international qua lity. When staying at our hotel, you're in one of country's most comprehensive shopping and business centers, the Complexo Center Shopping, which in addition to being a shopping center, features a convention center and the corporate UBT tower. Uberlândia is one of the largest cities of inland Brazil and boasts a privileged geographic location. With more than 650,000 inhabitants, it is a welcoming and thriving land with typical local characteristics. Hotel comprising two towers and six room categories, including premium Suites. Leisure area with swimming pool, sauna and fitness center. Covered car park with valet parking, monitored 24 hours a day. 269 fully equipped comfortable apartments, fitted with tiled flooring, air conditioning, WIFI Internet, safe, minibar, telephone in the bedroom and bathroom, cable TV, hair dryer in the bathroom and special services. The hotel has luxurious and fully equipped suites. Comfort and style for important occasions. Elegance and good taste sum up what the Clementina Bar is all about. A welcoming environment, good music, whiskey club and specialty international dishes. The perfect place to celebrate special occasions. 전체적으로는 만족입니다. 호텔의 모든 직원들이 친절했습니다. 출장 기간인 약 60일을 지내며 장기투숙을 했으나, 첫날부터 봤던 화장실 샤워부스의 벽에 붙어있던 누군가의 머리카락은 체크아웃할 때 까지 그대로였습니다. 세면대의 수전에서는 분수대처럼 물이 샜지만 점검을 하지 않는지 두달 내내 그대로였습니다. 그리고 어메니티는 채워주는 날, 그렇지 않은 날이 있었습니다. 그리고 Gym(휘트니스센터)에는 상주하는 직원이 있어야 할 것으로 보입니다. 기구에 대한 설명을 해줄 사람도, 정리하는 사람도, 무엇을 요청하고 싶어도 할 사람이 없었습니다. 마감할 때 청소해주는 직원 한분 뿐이었네요. 방역도 신경써야 할 것으로 보입니다. 지역 특성상 벌레가 많은 것 같았으나 방에 매우 큰 바퀴벌레도 나왔고 기본적으로 작은 바퀴벌레는 늘 있는 것 같아 그 부분이 매우 불쾌했습니다. 숙박시설은 좋은데 인터넷 속도가 너무 느리다. 개선이 필요하다. 트윈 침대방을 더블로 변경 요청하였지만 이루이지지 않았음.